China McClain’s career began in 2005 when she was seven years old, acting in the movie The Gospel (2005). She also played China James in Tyler Perry’s Daddy's Little Girls (2007), along with Idris Elba and her two sisters. However, she became nationally known after 2007, when she joined the cast of the series Tyler Perry's House of Payne as Jazmine Payne. In 2010, she co-starred in Grown Ups (2010) as Charlotte McKenzie. McClain became internationally known after starring in the Disney Channel original television series A.N.T. Farm, landing the role as Chyna Parks, from 2011 to 2014. Disney released the soundtrack of the television series A.N.T. Farm on October 11, 2011. McClain sings six songs and two solos with her sisters on the soundtrack, which debuted in the Billboard 200 at number 29 with 14,000 copies sold in its first week. On the soundtrack, McClain sang her version of Taio Cruz's "Dynamite." The release containing the song "Calling All the Monsters" reached the eighty-sixth spot on the Billboard Hot 100. McClain was a co-star in the 2013 sequel Grown Ups 2. In 2014, she appeared on the reality singing competition series, ABC's Sing Your Face Off and was the youngest contestant on the show, winning the show's first season. McClain starred as Gabby Harrison in the Disney Channel original movie How to Build a Better Boy (2014) with Kelli Berglund. She also appears as the main villain Uma in the Disney Channel Descendants 2 (2017), playing Ursula's daughter. 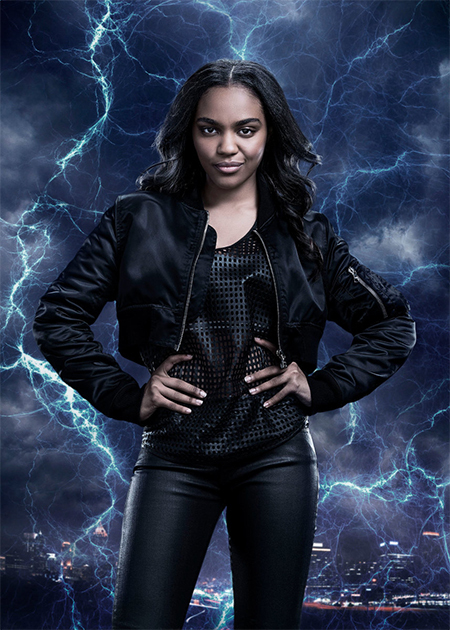 In 2018, McClain began portraying Jennifer Pierce in The CW superhero series Black Lightning.